Oath Craft Pizza in Davis Square is the newest off-campus venue to join the JumboCash program. The pizza restaurant approached the university about joining the program a little over a month ago, Oath’s general manager Christopher Ryder recalled. First-year Tufts Community Union (TCU) Senator Kevin Gleason, TCU’s Services Committee chair, acted as a liaison between Oath and Tufts Dining Services. Gleason saw the project as part of TCU Senate’s invigorated efforts to increase the number of off-campus venues in the JumboCash program. After meeting with Director of Dining and Business Services Patti Klos, Gleason learned that most juniors and seniors who live off-campus do not have full meal plans and rely on JumboCash instead. After speaking with upperclassmen senators, Gleason believed he understood why. Gleason said he and other senators posted a survey online this semester asking students where they would like to use JumboCash. Popular results included Boston Burger Company, Tamper, Pokéworks and Mr. Crepe. Because Dining Services does not actively solicit area merchants, according to Klos, Gleason and several other senators in the Services Committee took the initiative themselves. Using brochures from Dining Services that outline the basics of the JumboCash program, Gleason said he and the Services Committee approached restaurant managers individually. Klos estimated that with paperwork, installing processing equipment and lags in communication between Dining Services and the restaurant managers, a venue might wait four to six weeks before they can accept JumboCash. Klos said that expanding the use of JumboCash off-campus has virtually no disadvantages for the school and that the only drawback she anticipates for students is that merchants sometimes charge processing fees. There are a few obstacles, however, that must be overcome for a restaurant to join the JumboCash program. Gleason said that the companies he has approached have sometimes been concerned that accepting JumboCash could hurt business. Klos added that this percentage taken out of the sale contributes to the management of the JumboCash system, and the pool of funds allows the university to maintain these relationships. However, Klos said that some restaurants, especially new ones, believe that the required financial adjustments are worth it. Ryder seemed to echo this sentiment, seeing JumboCash as a means to increase business. 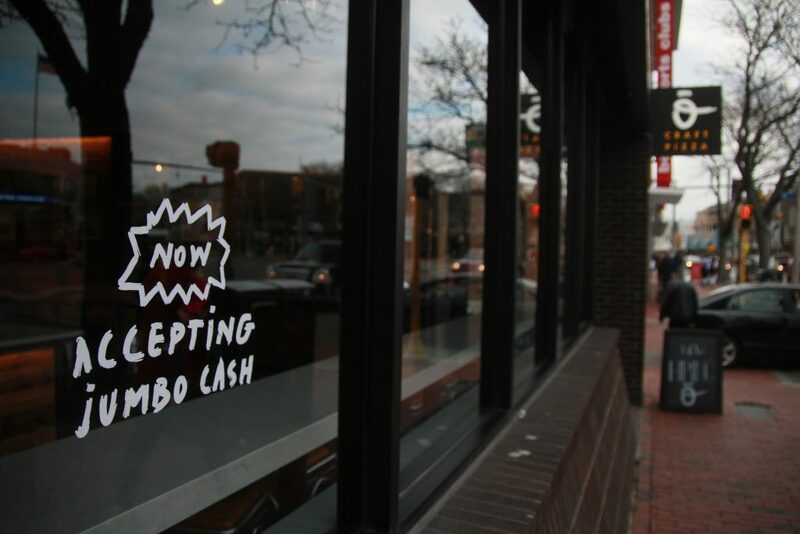 Since the fusion of the Dining Dollars and Points Plus programs in 2008, the number of businesses that accept JumboCash has grown from six to 22, and that number is still rising. Gleason and the Services Committee have been communicating with Boston Burger Company, Mr. Crepe and, most recently, bfresh. Gleason anticipates that bfresh will start accepting JumboCash next semester. Klos is excited about the expansion of the JumboCash program to supplement on-campus dining options.